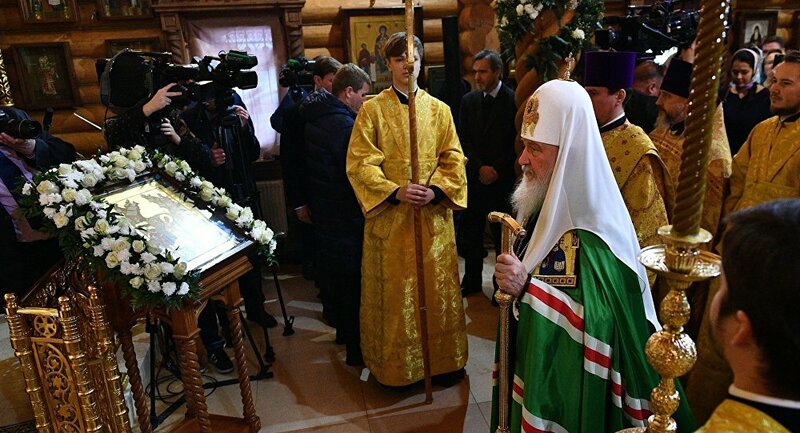 MOSCOW (Sputnik) - Patriarch Kirill, the head of the Russian Orthodox Church, has wished believers on Christmas Eve to maintain inner peace in the face of political and social turmoil. "The love of God, revealed in the Nativity of the Savior, brings true peace to people. This peace cannot be shaken either by everyday turmoil, social upheaval, political chaos or even armed conflict," Patriarch Kirill said in his annual speech, marking the Nativity. The Eastern Orthodox Church is preparing to celebrate Christmas on Monday, a day after Istanbul-based Ecumenical Patriarch Bartholomew handed over a decree to a new church in Ukraine that declared it independent from the Moscow Patriarchate, a move compared to the legalisation of schism by the Russian clergy. Although no Orthodox church except for Constantinople has officially recognized the newly created structure, Constantinople Patriarch Bartholomew handed over an independence decree — Tomos — to the head of the newly established Orthodox Church of Ukraine earlier on Sunday. Under the Tomos, the new church's jurisdiction will be restricted to Ukraine and it will not be authorized to appoint bishops and establish its parishes abroad, making it effectively dependent on Constantinople.